You have to hand it to Meat & Livestock Australia (MLA) specifically Rose Yong whose ingenuity gave rise to the brilliant Red Majesty Chefs programme. For years, Chinese dining has never been big on beef and lamb...until Rose had this brainwave to rouse local Chinese chefs, got them to put on their thinking toques and open their eyes, palate and mind to all the wonderful possibilities they can create with top quality Australian beef, lamb and mutton. So she whisked a bunch of them off to Australia even before Oprah Winfrey ever thought of pulling a similar stunt with her viewers! After numerous classes and a whirlwind tour where the Red Majesty Chefs were shown the A-Z on why Aussie beef and sheep meat are the choice of discerning chefs, the Red Majesty Chefs were literally chomping at the bit to put their new found knowledge to use. It was a year ago when the MLA proudly unveiled their Red Majesty Chefs to avid foodies and the media. I still remember we were feted to a succession of sumptuous beef and lamb dishes; all so contemporary but unmistakably Chinese in taste. This year, 22 local and 6 Singaporean chefs formed the Red Majesty Chefs brigade. Having wowed the Australian food trade Down Under recently, they cooked up a storm recently for a special dinner hosted by MLA; to showcase their culinary masterpieces of prime beef and lamb. The curtain raiser was Double Boiled Golden Ginseng Consomme with Beef Quenelle and Wolfberry. Having braved a horrendously stormy night and the city's eternal traffic jams, the exquisite broth was truly a soup for the soul. Needless to say, we also made short work of the attending ingredients: bouncy beef ball, tendon, bunashimeiji mushroom and baby nai pak. Understated sweet, spicy and peppery nuances teased our tastebuds in the sumptuous Wok Grilled Lamb Flap with Vietnamese Sauce proffered by Chef Ricky Thien from Prince Hotel & Residence KL. 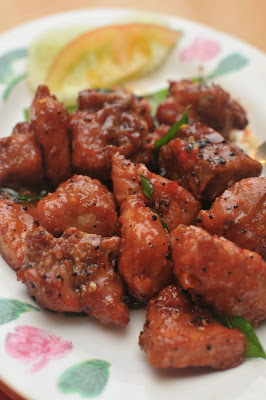 I love how the thick, viscous sauce clung to and permeated the tender meat. Who says Chinese chefs don't move with the times? The Red Majesty Chefs certainly proved critics wrong as there were several dishes that used the sous vide method (vacuum-packed food gently cooked in precise controlled temperature water-bath machines). The Sous Vide Beef Rump with Hot Curry Leaves & Brown Bean Sauce literally melted in our mouths; the meat's buttery tenderness greatly perked up by aromatic curry leaves and briny brown bean sauce. Taking a leaf from the classic Chinese dish of Tung Poh Yuk (braised fatty pork), the Braised Aurora Lamb piqued our interest with its remarkable resemblance to the original speciality. The chef even kept the cut streaked with fat in his attempt to mimic the real McCoy. The subsequent Oriental Braised Beef with Potato and Satay-Soy Sauce also took the retro Chinese route. This time around, we were told that it was the chef's take on the Hakka heritage dish of Khaw Yuk...The ensemble managed to capture the core essence of its unabashed rusticity. I was especially partial to the sauce. It's a pity we didn't have any man tou (plain Chinese buns) to wipe everything up! Deep-fried Spicy Lamb Flap was a labourious work of passion as the meat itself was double-boiled for six solid hours before the chef coated it in tempura batter for deep-frying. I felt somewhat guilty that we took so little time to devour something that has eaten so much time to prepare. At least the chef's happy we polished our plates clean! Braised Beef Rump with Spicy Sichuan Bean Sauce brought the curtains down on our indulgent beef and lamb feast. I was relieved that in spite of the many meaty offerings we had, there was still tummy room for dessert. The buah keluak is one tough nut to crack. Dark and mysterious with vein-like streaks, each seed from a mangrove swamp tree contains a hard and bitter kernel inside; an essential ingredient in the preparation of Ayam Buah Keluak, a typical Melaka Nyonya dish. According to Wikipedia, the raw seeds are deadly poisonous so they have to be boiled and buried in ash, banana leaves and earth for forty days; turning the creamy white nuts to dark brown or black. Chef William Koh from Batu Berendam, Melaka reveals that more soaking (up to 2-3 days) is necessary before the buah keluak can be used. He told us Ayam Buah Keluak is perhaps the most challenging dish in the Nyonya cuisine repertoire. "You must know to prepare and cook the buah keluak," says Chef Koh. "The kernel has a naturally sourish tang but it turn bitter if the cook's inexperienced. 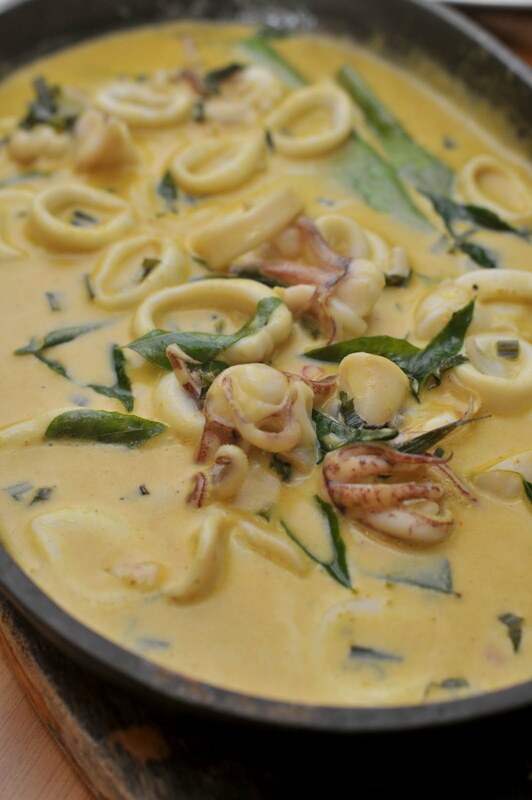 I usually cut the nut on top carefully to extract the kernel and then stuff a mixture of chicken and prawn paste back into the nut shell; giving the overall dish better flavour." For the Melaka Nyonya Food Promotion at Concorde Hotel Kuala Lumpur's Melting Pot Cafe that will run until 30 April, Chef Koh will dish up a plethora of robustly flavoured specialities from his home state as part of the outlet's nightly dinner buffet. Relish appetite-whetting salads such as Nyonya Acar, Kerabu Prawn & Mango, Kerabu Soo Hoon, Pineapple & Cucumber Salad and Kerabu Lady's Fingers complemented by assorted dips: Sambal belacan and Cincalok to get you going. Savour the mouth-watering tanginess of the Itek Tim Soup before tucking into a freshly made piece of Nyonya Popiah. You will find it hard to resist partaking platefuls of white rice laced with rich, sumptuous curries and spicy offerings that Melaka Nyonyas are famous for: Fried Brinjal with Chillies, Deep-fried Tempra Fish, Famosa Prawns, Curry Devil Chicken, Tauchew Tauhu and Omelette Petai Onions amongst others. Coconut is a central ingredient in many Nyonya dessert; with creamy coconut milk lending its enticingly rich taste in assorted sweet cakes known as kuihs or broths known as bubur. The grated white flesh is used as an outer coating or cooked with palm sugar to be made into a filling. Some of the popular sweet treats include Kuih Lapis, Kuih Jagung, Cendol, Sago Gula Melaka, Bubur Cha Cha and Pulut Hitam which went supremely well with a glass of Melting Pot Cafe's trademark Teh Tarik. The delicious albeit labour-intensive offerings we had bear ample testament to Chef Koh's skillful expertise and 16-year experience. In spite of such piquant and invigorating flavours, the chef himself admits a preference for Cantonese and Western cuisine; preferring to sit down to a good steak instead. 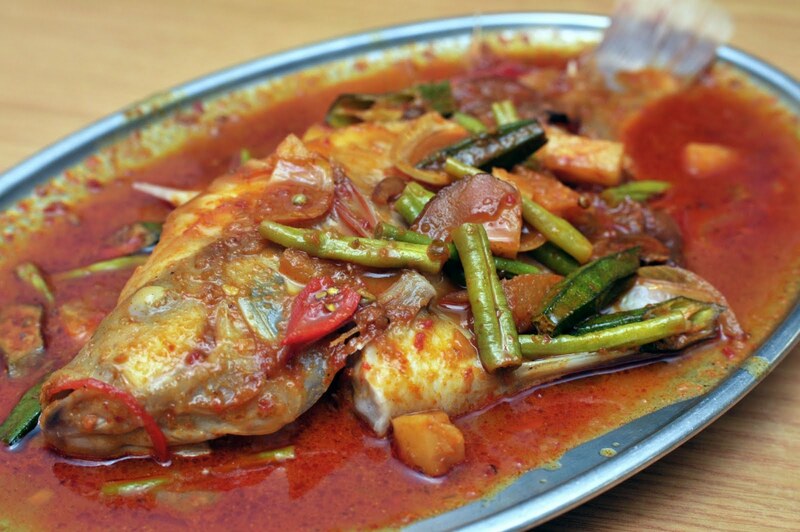 The Melaka Nyonya Buffet is priced at RM85++ per person and will be served from 7 pm to 10.30 pm at Melting Pot Cafe. In one chapter of Fuschia Dunlop's 'Shark's Fin & Sichuan Pepper' culinary tome, the writer recalled her dining experience feasting on what is known in Hong Kong as 'si fong choi'. Translated from Cantonese, it means private kitchen dishes which are rustled up by home cooks in some hideaway hole-in-the-wall eateries. Usually known only to a tight circle of ardent foodies, seats are hard to come by unless you know somebody who's clued in to the scene. In the Klang Valley, word has it that some outlets have sprouted up offering similar 'si fong choi'. One of them is Moon Sing, a modest, no-frills restaurant run by chef-owner Tim Ho right in heart of the Kepong Industrial Park. Thanks BigBoysOven for the heads up! Ho's family from Bukit Tinggi actually has their own vegetable and fish farm so these locally grown ingredients naturally take centrestage at Moon Sing. A great way for diners to eat local and reduce one's carbon footprints! 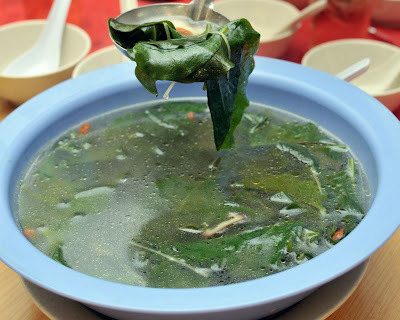 For our recent dinner, Chef Ho whipped up a plethora of his 'lah sau choi' (signature dishes) starting with a simple clear soup of 'tin chat' green...I've yet to find out the vege's proper name in English. Anyway the leaves look and taste kinda waxy and slightly crunchy like kelp. Heck, the soup must be good for us since there's 'kei chi' (wolfberries) and sliced black mushrooms in it as well. 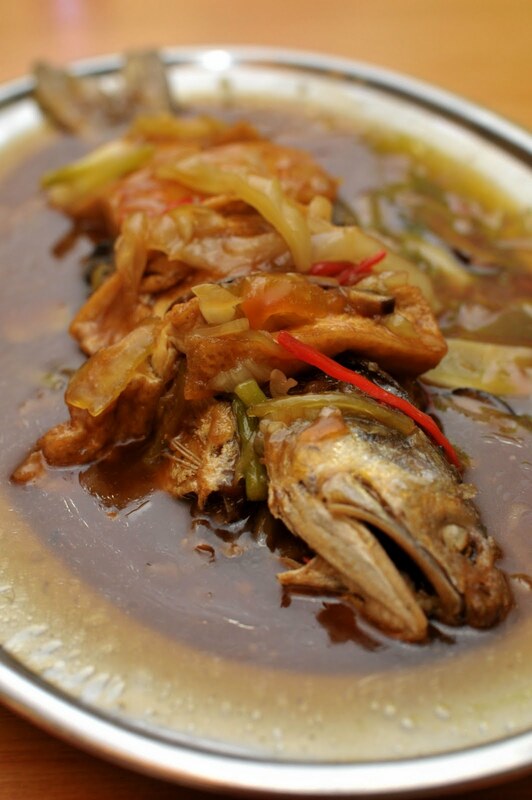 One of the best things about dining at Moon Sing is you can be assured the tilapia is super-fresh. 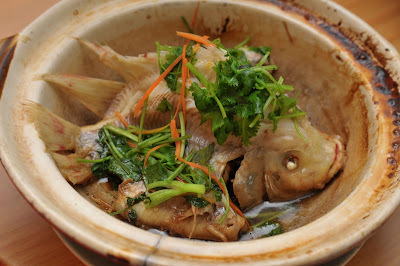 The Tilapia in Claypot is definitely a departure from the usual 'cheong cheng' (steamed with spicy bean paste sauce). Amazing how much flavour the chef manages to derive from the classic quartet of soya sauce, fresh coriander, ginger strips and spring onion! A sizzling delight worth returning for in my book. The subsequent Steamed Assam Tilapia sent our salivary glands into overdrive with its mouth-wateringly piquant flavours . It's simply unthinkable not to douse platefuls of white rice with the tangy, spicy and subtly sweet gravy! Textures rather than flavour hog the limelight in the pared down dish of Tenggiri with Fish Paste. One learns to develop a finer appreciation for the firm, slightly flaky flesh of the whole fried Spanish mackerel and its stuffing of springy fish paste that is flecked with red chilli. Homing in on the Braised Ma Yau with Tofu and Salted Vegetable, we found its sweet and sour nuances appetisingly endearing. It's the kind of home-style comfort food that salt-of-the-earth grandmothers and aunts would dish up using plain old elbow grease. Chef Ho seems to have an endless array of tricks up his sleeve. 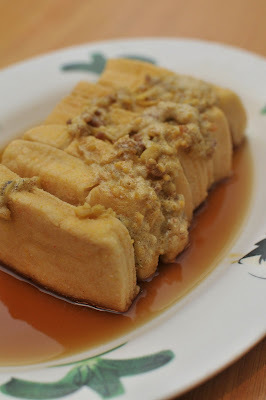 His signature Tofu with Salted Egg really knocked our socks off! One can't help but marvel at his deft frying skills that left the slices of custardly soft beancurd enveloped in a wafer-thin layer of crisp, briny batter. A thick, lumpy salted egg topping and light soya sauce lent the finishing touches to this humble creation. Now I'm partial to pork so the Three Flavoured Pork Ribs went down a real treat. The delicate sweet and briny accents have really seeped into the meat so each mouthful was superbly scrumptious. 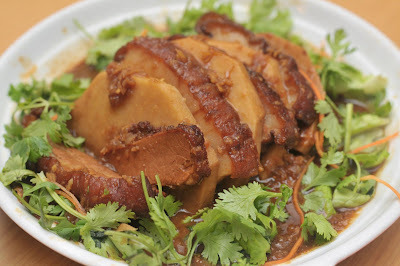 More nostalgia was evoked by the appearance of the evergreen Hakka 'Kau Yoke' (braised pork slices with yam). Rustic and hearty, the pork slices always come with a strip of rich melt-in-mouth fat and skin on top and alternated with sliced yam. Ho's version was faultless. After the whole melange of bold, strong flavours we had, the unexpected sweetness of the Lai Yau Sotong (squid in creamy butter sauce) caused a disconcerting jolt amidst the blend of evaporated milk, turmeric powder and curry leaves. Our last rave for the evening was the Brinjal with Garlic and Dried Prawns. Sure it was nothing to look at but the taste was distinctly memorable. 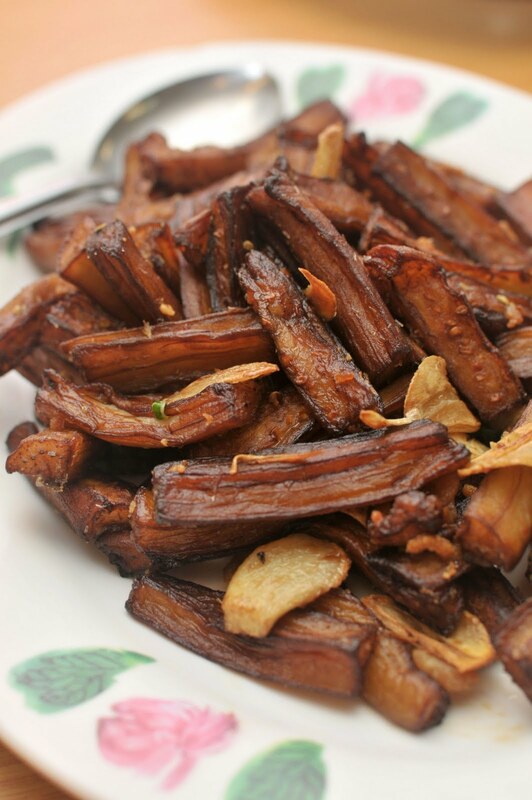 Cut into finger-thick strips, the deep-fried brinjal remains non-greasy and brimming with a faint smokiness. Sliced garlic flakes and gritty bits of dried prawns tinged the dish with their aromatic flavours. Moon Sing is worth checking out if you're into afforable, down-to-earth home-style specialities cooked with passion. Veteran restaurateur Simon Sangawa was once the head chef of the now-defunct Nadaman restaurant at Shangri-la Kuala Lumpur. He was also the change agent who helped the 5-star hotel transform the restaurant's classical ambience and culinary direction into modern, cutting-edge chic that is now Zipangu. Six years ago Sangawa-san again made his mark on the local food scene; steering his own Mizu restaurants (first at Bangsar Village followed by TTDI Plaza) to much success thanks to a fresh, no-holds-barred approach in redefining Japanese cuisine using French and other influences without compromising on the ingredients' freshness and customary aesthetics. Now looking to continue that winning streak, Sangawa-san has opened Kin No Mizu at The Intermark. While the emblematic mainstays of sushi, sashimi, teppanyaki and tempura remain untouched, Sangawa is giving free rein to his most trusted lieutenant and former protégé, Brhma Dava aka Chef Devan to proffer a selection of trendy fusion dishes to patrons. It is amazing how a dish of simple, braised daikon (radish) becomes a gastronomic delight with an indulgent topping of pan-fried goose liver in the house speciality of Foie Gras with Simmered Daikon (RM48++). The exquisite sweetness from the chunks of soft, tender radish and the clear broth left me at a loss for words; its orgasmic effect amplified manifold by the accompanying goose liver's indulgent richness and velvety smoothness. The Yellow Tail Carpaccio with Chilli Padi and Wasabi Soya Sauce (RM55++) proves to be a stimulating palate pleaser; a cohesive blend of ripe briny accent (salmon roe) with fiery spiciness (bird's eye chilli) and grassy sharpness (spring onion) against a backdrop of mildly fatty albeit pristine flavours (yellow tail). Go easy on the soy and sesame dressing if you are ordering the Maguro Tataki Salad (RM35++) or else you'd find the salad of seared tuna slices, avocado, lettuce, onion and cherry tomatoes too salty. Be forewarned though that the dish's forceful onslaught may leave your palate somewhat blunted. My partner and I had a hard time discerning the rich, sweet nuances of the Sautéed Jumbo Prawns and Scallops with Truffle Sauce (RM65++). Personally I find springy ramen and tangy-sweet tomato-based broth make strange bedfellows. But the Tomato Ramen (RM20++) may just appeal to today's new breed of diners who are raised on hamburgers, pastas and pizzas. Admittedly, the gravy grows on you after a while - sprinkle on some togarashi (Japanese seven-flavoured spice) and the dish tastes almost similar to mee rebus gravy. Laden with bonito flakes, cabbage, laver, prawns, scallops and pea sprouts, the delicious Yaki-Spa (RM35++) is winsome for its simple unconventionality. The only offering that I wasn't big on was the Kin No Mizu Roll (RM45++). I find the cream cheese's cloying richness too strong against the delicate accents of fresh salmon and yellow tail slices that adorned the vinegared rice rolls. Decor-wise, Kin No Mizu replicates some elements found at its sister Mizu outlets: from the external feature wall with cascading water to the clear glass walkway atop a bed of running water and oval stones. Tucked within its tranquil Zen-like interior is a sushi and a teppanyaki counter, and some private or semi-private dining rooms for small and medium-sized groups. So if you're inclined to Japanese cuisine with nouveau touches, you can't go wrong at Kin No Mizu. For reservations at Kin No Mizu, call 03-2166 2888. Address: Lot 211, Level 2 of The Intermark (adjacent to Doubletree Hilton), Jalan Tun Razak, Kuala Lumpur.